Published: July 9, 2014 at 11:04 a.m. Updated: July 9, 2014 at 12:06 p.m. While the vast majority of players selected every year will come from the FBS ranks, there still were 26 non-FBS players selected in the 2014 NFL Draft. Included in that total was one FCS player selected in the second round, Eastern Illinois quarterback Jimmy Garoppolo. And there were four non-FBS players in the third round. As part of our "14 for '14" series, here's a look at 14 of the best small-school prospects for the 2015 draft; all are seniors, and each will be on scouts' radar this fall. Buzz: Bennett's name should be familiar to fans, especially to those who follow the Pac-12: He was the quarterback Marcus Mariota beat out to earn the starting job at Oregon in 2012. Bennett was Mariota's backup that fall before transferring to Southeastern Louisiana last season. The junior threw for 3,165 yards and 21 touchdowns and rushed for 1,046 yards and 16 touchdowns (a single-season school record) for the Lions last fall. 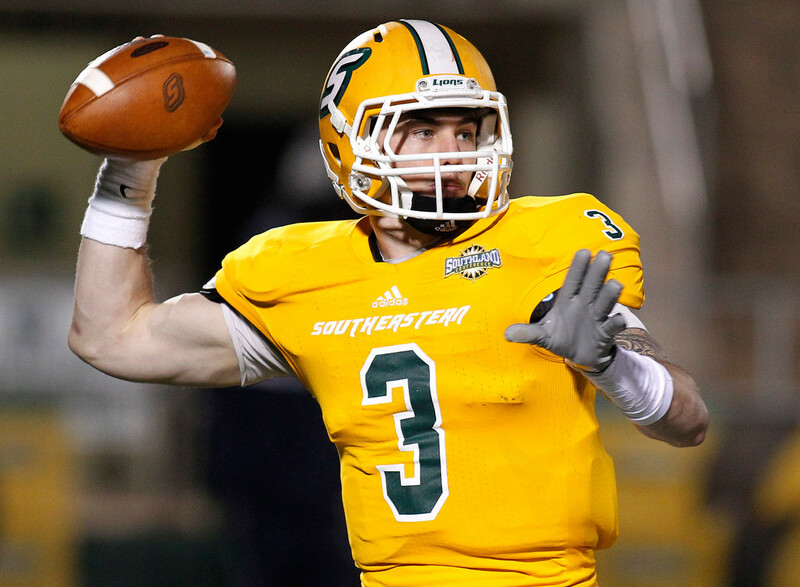 Bennett, who led the Lions to the quarterfinals of the FCS playoffs, was the Southland Conference Player of the Year. Scouts will be looking to see if he can improve his accuracy this fall; he completed 61 percent of his passes last season. Buzz: Epperly is the reigning Ivy League Offensive Player of the Year and won the award in his first full season as the starter. Epperly completed 68 percent of his passes and threw for 2,137 yards and 25 TDs (against just three interceptions) last season; he also ran for 570 yards and 18 TDs in 10 games. Epperly, who is left-handed, accounted for at least three touchdowns in each of the Tigers' last nine games in 2013 and completed an NCAA-record 29 consecutive passes in a win over Cornell. Princeton scored 50 points five times last season; the Tigers had scored 50 points five times in previous 48 seasons. Buzz: Johnson is heading into his third season as a full-time starter for the Panthers; he was a part-time starter as a redshirt freshman in 2011. Scouts like his size and speed combo (he has been clocked in at sub-4.5 seconds in the 40). Johnson also is proficient as a receiver, but his main talent is as a runner; he will run behind a good offensive line this fall and should easily top 1,000 yards for the third consecutive season. Buzz: Kumerow has good size and good hands and is a deep threat for the Warhawks, the reigning Division III national champions. He also is the son of former NFL first-round pick Eric Kumerow; the nephew of former NFL first-rounder John Bosa; and the cousin of Ohio State star sophomore defensive end Joey Bosa. Jake Kumerow began his career at Illinois but transferred to Division III Wisconsin-Whitewater before the 2012 season. Last season, Kumerow had 77 catches for 1,331 yards (17.3 yards per reception) and 19 TDs; he had six games with multiple TD receptions and had five 100-yard games, including a 103-yard, two-touchdown performance in a 52-14 rout of Mount Union (Ohio) in the Division III title game. Buzz: Manhart will be a three-year starter at left tackle for the Lopers, a Division II program. Manhart is big, strong -- he can squat 500 pounds -- and plays with a mean streak, but he's also nimble enough to play H-back in what Nebraska-Kearney calls its "hammer package." Manhart was one of four Mid-America Intercollegiate Athletics Association players named a first-team All-American by the American Football Coaches Association last season; two of the other first-team members -- Pittsburg State wide receiver John Brown and Lindenwood cornerback Pierre Desir -- were taken in the 2014 NFL Draft. Manhart was the only unanimous selection on last season's All-MIAA first team. Buzz: McBride will be a three-year starter for the Tribe and is coming off a season in which he had 63 receptions for 801 yards and five TDs. McBride also served as the Tribe's kick returner and averaged 27.5 yards per return. He has 15 TD receptions in the past two seasons and runs well for a guy his size (he has been clocked sub-4.4 in the 40). Buzz: He will be a four-year starter for the Salukis and has been remarkably consistent, catching between 43 and 48 passes for 562 to 601 yards in each of the past three seasons. His touchdown total has been consistent, too, going from three in 2011 to four in 2012 to five last season. He was ranked third nationally in receptions (48) among tight ends in the FCS last season despite missing two games with a broken leg. He plays in a run-oriented offense and is a solid blocker. He also has H-back potential at the next level. Buzz: Rodgers has been a finalist for the Harlon Hill Trophy -- which goes to the top player in Division II -- in each of the past two seasons. Last season, he threw for 4,807 yards with 40 TDs and 12 picks, and completed 68.95 percent of his passes. He threw for 4,002 yards and 41 TDs in 2012. He has thrown for at least 400 yards nine times in the past two seasons and has 18 300-yard games in that span. Rodgers, who already has graduated and is working on his MBA, holds school records for passing yards, touchdown passes and completions. Fans will get a chance to see Rodgers on the CBS Sports Network on Sept. 18, when Henderson State (which is located in Arkadelphia, Arkansas) plays host to Southeastern Oklahoma. Buzz: Saunders was a two-year starter at safety at Florida before he was kicked off the team late in the 2012 season. He had four interceptions, 39 tackles and nine pass breakups for Tennessee State last season as a cornerback, but his best pro position might be safety. Saunders -- who started as a true freshman at Florida -- lacks elite speed, but he has great instincts, is active in run support and can lay the lumber. Saunders has NFL talent, but red flags are flying with regard to his character. Buzz: Tartt has good size and is extremely active in run support; he also runs well for his size (he has been clocked as fast as 4.46 in the 40). He had 98 tackles last season for the Bulldogs -- the year the team won the Southern Conference. He also had one interception, which he returned for a score, and nine pass breakups. Tartt has made 192 tackles and scored three defensive touchdowns in the past two seasons. The safety only played one season of high school football in Mobile, Alabama. Buzz: Trail is an intriguing prospect because of his size, production (he had 8.5 sacks and 94 tackles last season) and background (he began his college career at Florida and was considered one of the nation's top high school defensive ends at powerhouse Miami Washington). He also had 12.5 tackles for loss, five forced fumbles, two blocked kicks, 10 quarterback hurries and eight pass breakups last season. He has 14.5 sacks and 29.5 tackles for loss in two seasons with the Spartans. Trail has gained more than 40 pounds since graduating from high school. Of note: He didn't play at all at Florida -- he redshirted as a true freshman in 2010 and did not seeing any time in 2011 before deciding to move on. But as he has gained weight, he has made big strides on the field. His size and pass-rush skills are notable. Buzz: Tuaau, a native of Hawaii, made a huge impact in his first season with the Division II Lions after transferring from a California junior college; he had 12.5 sacks and 25.5 tackles for loss -- staggering numbers for a nose tackle -- in garnering Lone Star Athletic Conference Defensive Player of the Year honors last fall. Tuaau signed with Hawaii out of high school but ended up at Pasadena City College in 2011. He played for Riverside community college in 2012 then signed with Oregon State in February 2013. But he didn't meet OSU's academic requirements and ended up at Texas A&M-Commerce (known as East Texas State until 1996), which is located in a town of population 9,000 about an hour northeast of downtown Dallas. His disruptive nature will intrigue NFL scouts. Buzz: Wagenmann is easy to spot when you watch a Grizzlies game on TV -- he's the guy whose long blond locks are flowing out of his helmet when he is running down opposing quarterbacks. He will be a three-year starter for one of the best FCS programs in the nation and has 20 sacks and 29.5 tackles for loss in his career. Wagenmann had 8.5 sacks, 64 tackles and three forced fumbles last season. His pass-rush prowess is what has garnered notice from scouts. He didn't get serious about football until he was a junior in high school, instead concentrating on basketball. Buzz: Williams is big, physical and active. The then-junior had 74 tackles last season to go with 5.5 sacks and 12 tackles for loss; he also blocked five kicks in the 2012 season, one of which occurred against Wisconsin. Williams is a former high school wrestler who does a good job with leverage considering his height.